In Stock and Shipping Now - The New and improved Mark IV version of the legendary clickstop Zoom from Baader. This most highly rated Hyperion zoom-eyepiece is available now in its fourth generation and has become a lot more versatile. The 290 gram housing is lighter by 80 grams and now features a slim 55 mm diameter, both features that make it even more desirable for use with binoviewers. The adjustable eyecup can be removed to expose a video/photo thread and create the maximum in "nose space". The click-stop action has been smoothed out to more easily access the magnification stops at 8/12/16/20 and 24mm. Click-stops are mandatory to easily and precisely set both eyepieces to the same focal length for effortless binocular observation without eye-strain. The zooming-mechanism as well as the inner zooming rails for all lens groups have been modified to improve cold temperature operation and the parfocality for each focal length has been finetuned. Most important however – the Mark IV offers almost 4 mm more backfocus. This is most beneficial for application with a multitude of spotting scopes. Many spotting scopes nowadays do allow the mechanical insertion of astronomical 1¼" eyepieces – but in many cases this combo cannot focus to infinity. By utilizing the supplied spotting-scope adapter ring "A", the Hyperion Universal Zoom almost reaches almost four mm deeper into the eyepiece clamp of all those spotters, to safely reach infinity focus. When removing the1¼" nosepiece, a 1 3/8" thread inside the "A"-ring will make the Mark IV firmly thread onto all Celestron-Ultima spotters and it´s namesakes. 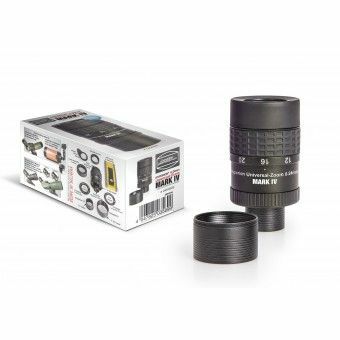 Optional available is a bayonet-adapter for Zeiss Diascope-spotters. Threaded adapters for many other famous spotting scope brands (that still don´t allow 1¼" eyepiece adaptation) will become available in the future – now that it makes sense to produce them. When using the Mark IV on a telescope though, the "B"-ring (supplied) should be chosen instead, to keep the bottom of the eyepiece flush with the upper end of most star diagonals. Otherwise the bottom 2" SC-threaded holding ring that holds the "A" or "B" ring in place may directly rest on the clamping screws of the star diagonal. The supplied 2" SC-ring also allows the Mark IV to firmly mount the eyepiece onto any SC-thread, especially onto our 2" clicklock star diagonal, with the help of the 2"/2" adapter (#1508020).